Hawaii senior center Brittany Grice led the Rainbow Wahine with 14 points in her last game at the Stan Sheriff Center. On this play, she was fouled while driving to the basket against Amber Hall and Alisha Hicks of San Jose State. Four Rainbow Wahine seniors scored in double-figures to lead Hawaii to a 64-53 Western Athletic Conference victory over San Jose State last night before a senior night crowd of 752 at the Stan Sheriff Center. Co-captain Brittany Grice led the way with 14 points, Amber Lee scored a career-high 12 points, Janevia Taylor also had 12 and Pam Tambini contributed 10. Acting head coach Pat Charity started the five seniors -- Taylor and Cassidy Chretien at guard, Tambini and Lee at forward and Grice at center -- and they combined for 56 points and 28 of UH's 43 rebounds. Hawaii (14-12, 8-6 WAC) extended its winning streak to seven games in its final home appearance of the season. "I couldn't be happier for all the seniors. We pulled together and gritted it out," Grice said. Chretien grabbed the opening tip and drove the right lane for a layup. The Wahine quickly built an 11-2 lead on field goals by Lee, Taylor and Chretien and Grice's 3-point play after 3:31 of action. With Myosha Barnes and Brittany Powell scoring four points apiece, the Spartans (4-25, 4-11) outscored the Wahine 12-5 over the next 6 minutes to close to 16-14 at the 10:32 mark. Neither team shot particularly well from the floor over the next 7 minutes. San Jose State connected on four field goals and the Wahine just two, 3-point shots by Tambini and Taylor. 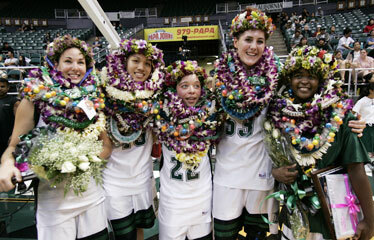 Seniors Pam Tambini, Amber Lee, Cassidy Chretien, Brittany Grice and Janevia Taylor were bedecked with leis last night after their last home game with the Rainbow Wahine. A drive along the right baseline and reverse layup by Barnes with 4:51 left kept the Spartans within four at 24-20. The Wahine then held the Spartans scoreless the remainder of the half while scoring seven of their own for a 31-20 lead at intermission. Lee's layup off a quick pass from Amy Kotani, two free throws by Saundra Cariaga and one by Kotani, and Tambini's layup with 34 seconds to play accounted for the 7-0 run. The Wahine opened the second half with another 7-0 run, taking just 2:21 to do it. The two jumpers by Grice and Chretien's 3-pointer from the left corner gave Hawaii a 38-20 lead. The Spartans did not score until Jaime Hall hit a 14-footer with 16:38 remaining. A three-point play by Grice and a driving layup by the 6-foot-4 center put UH ahead 43-24 with 14:04 left. Natalie White, a 5-9 guard, then scored seven consecutive points for SJSU to cut the Spartans' deficit to 43-31. "I think we let up pretty early (in the second half). We got too relaxed too soon," said Charity. "They started to drive, then kick the ball out for some easy baskets. We had to keep plugging away at it and we got the win." Tanya Smith, Hawaii's leading scorer, broke the drought with a layup at 11:05, her first points of the game. The Spartans made good use of bonus free throws to stay within range of the Wahine. A driving layup by Alisha Hicks and two buckets from Powell cut UH's lead to 59-53 with 1:31 to go. Tambini's two free throws with 1:01 left sealed the win and Kotani put an exclamation point on the victory with a trey with four ticks to go. White was the high scorer for the Spartans with 15 points. Barnes and Powell scored 12. The Wahine finish the season on the road with regular-season games at Idaho and Boise State next week before moving on to the WAC tournament at New Mexico State, March 6-10. 3-point goals -- SJSU 1-11 (White 1-2, Williams 0-1, Barnes 0-2, Hicks 0-3, Jacobs 0-3), Hawaii 4-12 (Chretien 1-2, Kotani 1-2, Tambini 1-4, Taylor 1-4). Personal fouls -- SJSU 22, Hawaii 18. Fouled out -- J. Hall. Steals -- SJSU 8 (Barnes 3, Williams, J. Hall, A. Hall, Hicks, Powell), Hawaii 7 (Tambini, Lee, Taylor, Chretien, Kotani, Cariaga, Smith). Blocked shots -- SJSU 6 (Williams, J. Hall, A. Hall, Hicks, Jacobs, Powell), Hawaii 4 (Grice 2, Tambini, Zagrobelna). Turnovers -- SJSU 16 (Jacobs 5, J. Hall 3, Barnes 2, Hicks 2, White 2, Powell, TEAM), Hawaii 17 (Chretien 4, Grice 4, Lee 2, Tambini, Taylor, Kotani, Cariaga, Smith, Zagrobelna, TEAM). Officials -- Bret Gervasoni, Brian Yamasaki, Alex Moreno. A--752.